Fees at the country’s 17 most visited national parks would nearly triple under a proposal from the National Park Service. 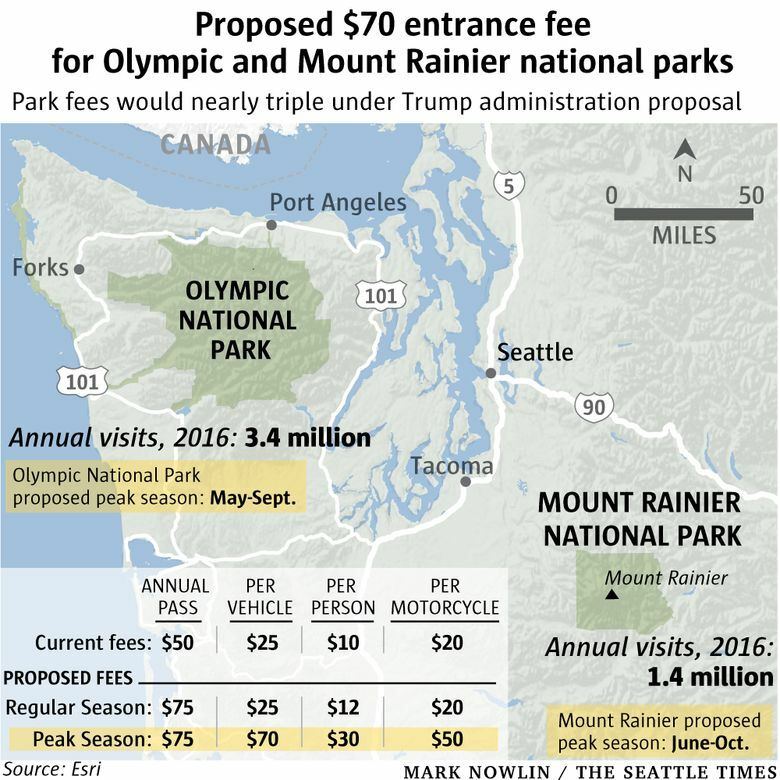 A walk in the park might take a trip to the bank under massive fee increases proposed at the country’s most visited national parks, including Mount Rainier and Olympic national parks. Announced by the National Park Service on Tuesday, the proposal would nearly triple the prime-time entrance fee for both parks to $70 per car from $25. The increase comes on top of a recent hike in the lifetime pass for seniors from $10 to $80. More money is needed to pay for national-park maintenance, the park service said in a news release announcing the fee-hike proposal. “It’s way out of line; it’s a huge increase, very sudden, with no chance to really comment on it,” Smith said. The public-comment period opened Tuesday and concludes in 30 days. 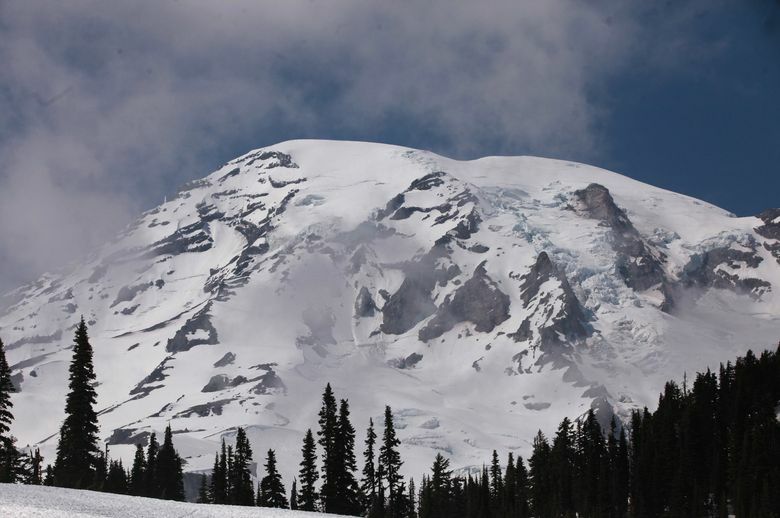 The fee increase is proposed at the country’s 17 most frequently visited national parks, including Mount Rainier and Olympic, during the peak-visitation months for each park on the list. At Mount Rain­ier, the peak-season fee would be charged June through October; at Olympic, the peak season would run from May through September. Some were stunned by the proposal. “What the heck?” said Joe Camacho, of Latino Outdoors, a Seattle-based nonprofit that works to connect more Latino residents with outdoor recreation. “This is a great way to decrease diversity in the national parks. With nearly 5 million annual visits between them in 2016, Olympic and Mount Rainier national parks made the cut of most-visited parks. North Cascades National Park would not be affected, with 28,646 visits in 2016. It is one of the country’s least visited national parks. Pass holders — such as the America the Beautiful national parks and federal recreational lands pass or senior pass — would not be affected by the fee hike. Marsha Massey, executive director of the Olympic Peninsula Visitor Bureau, saw a bright side to the fee hike. “If it encourages people to visit in the offseason, that can be a good thing, too, for everybody,” Massey said. Buying an annual pass also provides a possible solution for the fee hike, she noted. Implementing the new fees is intended to raise total entrance fees from $200 million annually to $268 million annually. Smith agreed the parks need money to tackle maintenance backlogs at national parks. But to him, the National Park Service Legacy Act, HR 2584 and SB 751, pending in Congress and backed by Washington’s congressional delegation on both sides of the aisle, is a better solution than targeting only visitors. The legislation would put a portion of federal mineral revenues toward national-park maintenance.